A quick exercise on graph modeling. I recently got inspired from one of Nicole White’s post who did something similar with the Dallas Fort Worth Airport (DFW) data. 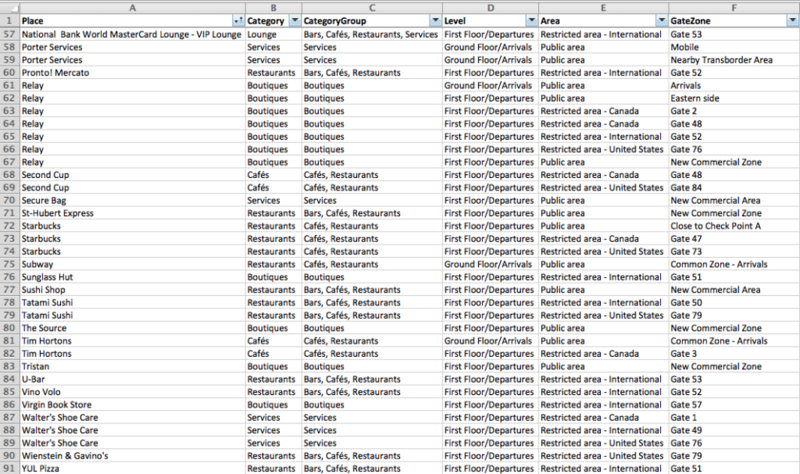 So I decided to create a Neo4j graph database of the shopping places (boutiques, restaurants and services) at the Montreal-Pierre Elliott Trudeau International Airport (YUL). There isn’t any raw data to download on the site. So I will spare you the details of my scrapping efforts and instead share with you my findings and results. You can view and download the data here from Google Drive. The code, sample queries and database backup can be found on Github. Case in Point: A Place ‘Tim Hortons’ belongs in a Category ‘Cafés’ and that Place is located at a Gate ‘Gate 3’ in the following Area ‘Restricted area – Canada’ on a certain Level ‘First Floor/Departures’. Pretty straight forward and from that perspective we can create our model. With the extracted CSV files will be using Cypher’s LOAD CSV command to transform and load the content into a graph structure. Take time to explore the data and try to write your own queries!